Jayalalitha Health: Jayalalithaa death reports following a cardiac arrest are being reported by some Tamil TV channels on Monday, December 5. However, Apollo Hospitals have claimed that Tamil Nadu (TN) Chief Minister (CM) Amma J Jayalalithaa is still alive and not dead yet. According to the official release, Jaya continues to live on the life support. 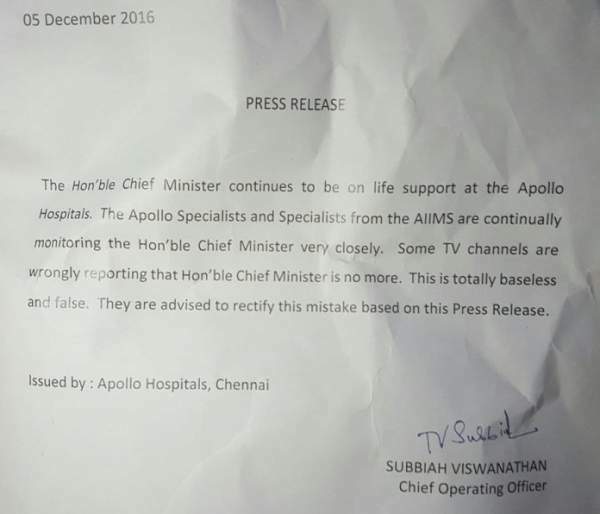 The Chief Operation Officer (COO) of Apollo Hospital S Viswanathan has claimed such reports false. He also said that CM Jayalalitha is under the close care of experts where they are continuously monitoring her. Tamil Nadu CM J Jayalalithaa breathed her last at 11.30 pm (December 5). Some television channels have wrongly reported that their beloved and honorable Chief of the state and party has died. He also said that the death reports are baseless and false. Following the official reports, the TV channels corrected their mistakes. Check: Jayalalitha News & Updates: Latest Developments, Click Here To Know. It was first released on three Tamil television channels. One of them is Jaya TV. They stated that CM has passed away at the Apollo Hospital. Then, people started sharing that she is no more. However, minutes later the hospital tweeted that a special team of doctors is taking care of her and she is under close care. Moreover, they said that doctors are trying to save her with every possible life-saving measures. It should be clear by now if is Jayalalitha dead or alive now? Puratchi Thalaivi Amma is alive on the life support, and her health condition is critical. Some channels wrongly took the developments. The Apollo Hospitals tweeted regarding using its official Twitter handle. The violence started outside as the fake news and updates aired. However, the crowd is under control till now. The Chief Minister suffered cardiac arrest for which she was admitted to the Apollo Hospital. Earlier, the 68-year-old J Jayalalitha was admitted on September 22 in AIIMS.